Gimme a rocketship – we want to see what those bands are made of! This is a strange view of Jupiter, a familiar gas giant that humanity has sent several spacecraft to. This particular view, taken in 2000 and highlighted on the European Space Agency website recently, shows the southern hemisphere of the mighty planet. The underneath glimpse came from the Cassini spacecraft while it was en route to Saturn. Lucky for researchers, at the time the Galileo Jupiter spacecraft was still in operation. But now that machine is long gone, leaving us to pine for a mission to Jupiter until another spacecraft gets there in 2016. That spacecraft is called Juno and is a NASA spacecraft the agency sent aloft in August 2011. And here’s the cool thing; once it gets there, Juno is supposed to give us some insights into how the Solar System formed by looking at this particular planet. “Underneath its dense cloud cover, Jupiter safeguards secrets to the fundamental processes and conditions that governed our Solar System during its formation. As our primary example of a giant planet, Jupiter can also provide critical knowledge for understanding the planetary systems being discovered around other stars,” NASA wrote on the spacecraft’s web page. The spacecraft is supposed to look at the amount of water in Jupiter’s atmosphere (an ingredient of planet formation), its magnetic and gravitational fields and also its magnetic environment — including auroras. Much further in the future (if the spacecraft development is approved all the way) will be a European mission called JUICE, for Jupiter Icy Moon Explorer. The mission will check out the planet and three huge moons, Ganymede, Callisto and Europa, to get a better look at those surfaces. It is strongly believed that these moons could have global oceans that may be suitable for life. Earlier this month, the European Space Agency approved the implementation phase for JUICE, which means that designers now have approval to come up with plans for the spacecraft. But it’s not going to launch until 2022 and get to Jupiter until 2030, if the schedule holds. Meanwhile, observations of Jupiter do continue from the ground. One huge finding this year came from the Hubble Space Telescope, which confirmed observations that the Great Red Spot is shrinking for reasons that are yet unknown. A large comet that peppered Jupiter two decades ago brought water into the giant planet’s atmosphere, according to new research from the Herschel space observatory. Shoemaker-Levy 9 astounded astronomers worldwide when its 21 fragments hit Jupiter in June 1994. The event was predicted and observatories were trained on Jupiter as the impact occurred. The dark splotches the comet left behind were even visible in small telescopes. But apparently, those weren’t the only effects of the collision. Herschel’s infrared camera revealed there is two to three times more water in the southern hemisphere of the planet, where the comet slammed into the atmosphere, than in the northern hemisphere. Further, the water is concentrated in high altitudes, around the various sites where Shoemaker-Levy 9 left its mark. It is possible, researchers acknowledged, that water could have come from interplanetary dust striking Jupiter, almost like a “steady rain.” If this were the case, however, scientists expect the water would be evenly distributed and also would have filtered to lower altitudes. Jupiter’s icy moons were also in the wrong locations, researchers said, to have sent water towards the massive planet. Internal water rising up was ruled out because it cannot penetrate the “cold trap” between Jupiter’s stratosphere and cloud deck, the researchers added. “According to our models, as much as 95 percent of the water in the stratosphere is due to the comet impact,” said Thibault Cavalié of the Astrophysical Laboratory of Bordeaux, in France, who led the research. While researchers have suspected for years that Jupiter’s water came from the comet — ESA’s Infrared Space Observatory saw the water there years ago — these new observations provide more direct evidence of Shoemaker-Levy 9’s effect. The results were published in Astronomy and Astrophysics. Herschel’s find provides more fodder for two missions that are scheduled for Jupiter observations in the coming few years. The first goal for NASA’s Juno spacecraft, which is en route and will arrive in 2016, is to figure out how much water is in Jupiter’s atmosphere. 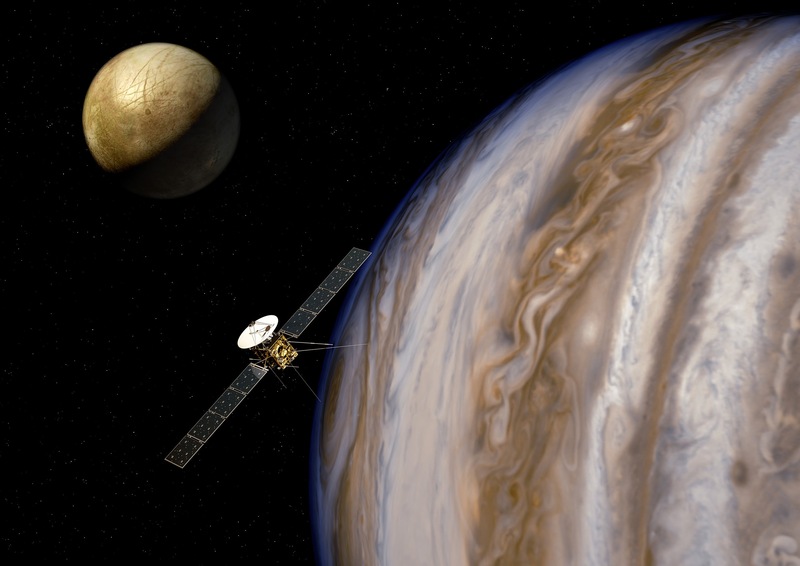 Additionally, ESA’s Jupiter Icy moons Explorer (JUICE) mission is expected to launch in 2022. “It will map the distribution of Jupiter’s atmospheric ingredients in even greater detail,” ESA stated. While ESA did not link the finding to how water came to be on Earth, some researchers believe that it was comets that delivered the liquid on to our planet early in Earth’s history. Others, however, say that it was outgassing from volcanic rocks that added water to the surface. Conventional theory dictates ice was in our solar system from when it was formed, and today we know that many planets have water in some form. Last year, for example, water ice and organics were spotted at Mercury’s north pole. Mars appeared to be full of water in the ancient past, as evidenced by a huge, underground trench recently discovered by scientists. There is frozen water at the Martian poles, and both the Curiosity and Spirit/Opportunity rover missions have found evidence of flowing water on the surface in the past. The outer solar system also has its share of water, including in all four giant planets (Jupiter, Saturn, Uranus and Neptune) and (in ice form) on various moons. Even some exoplanets have water vapor in their atmospheres. Whatever mission is chosen for the next flagship science mission, ESA knows it will likely have to do it on their own. In March 2011, NASA informed ESA that that it was highly unlikely that they could become a major partner in an “L” (large) mission for the 2020 timeframe. With NASA no longer in the mix, ESA knew they would have to descope their proposed missions, and with costs needing to be at least 20% less than originally planned. “Needless to say, missions within these constraints must be significantly less complex than the original L mission concepts selected in 2007,” the report says. ESA’s science goals for the front-runner JUICE mission is to visit the Jupiter system concentrating on the characterization of three possible ocean-bearing worlds, Ganymede, Europa and Callisto as planetary objects and potential habitats and on the exploration of the Jupiter system considered as an archetype for gas giants in the solar system and elsewhere. The focus of JUICE is to characterize the conditions that may have led to the emergence of habitable environments among the Jupiter’s icy satellites.